First Metro Securities financial literacy speaker Robbi Samson explains the benefits of investing in stocks and mutual funds to OFWs. 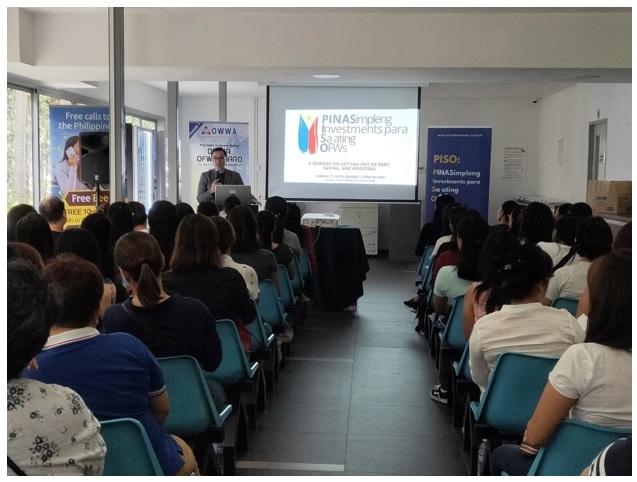 20 March 2019 – The Philippine Embassy in Singapore facilitated a series of financial literacy forums conducted by stockbrokerage firm First Metro Securities on 16-17 March 2019 in Singapore. The first financial literacy forum focused on investing in blue chip stocks, equities and mutual funds. It was held at the Embassy chancery on 16 March and was attended by 95 Filipino professionals working in Singapore. The second forum focused on basic financial literacy and getting out of debt. It was attended by 87 Filipino household service workers and was held on 17 March at the chancery. The third activity was a workshop on the use of technical and analytical tools for decision- making on buying and selling stocks.